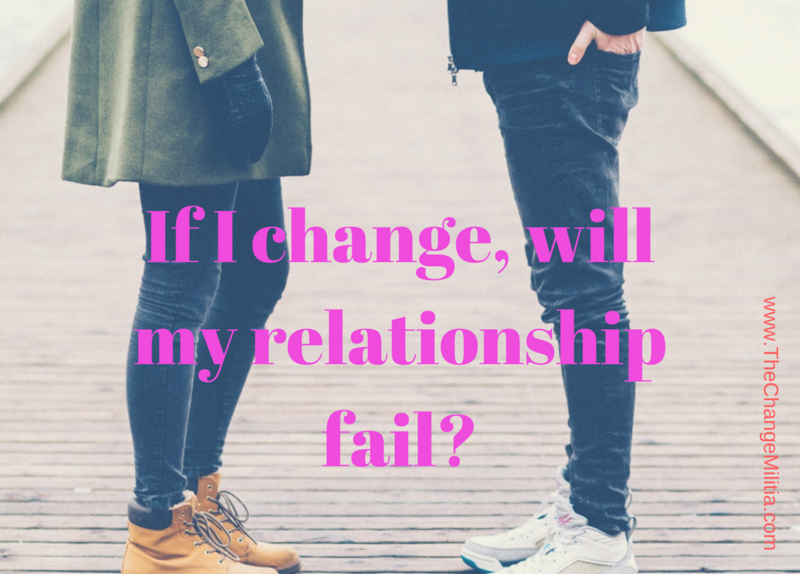 If I change will my relationship fail? The unspoken fear about growing. There is so much fear around changing the big stuff. But what I usually say is that if you just pause and work on the foundation, you go inwards, the things that don’t serve you are going to fall away anyway. If the relationship isn’t aligned with who you want to be, what is going to eventually happen is that relationship isn’t going to very interesting to you anymore and you’re going to make a decision that the relationship is going to die off on its own, it is not going to be this big explosion that requires you to cut off your arm to get rid of it. Jeff: In terms of relationship or any of the changes that we are going to make, as we begin to change internally, one of the things we do, and something we talk a lot about in the program, is what value are we placing on things. So right now, if you are in a relationship that is not fulfilling, you still have a huge attachment to that relationship, otherwise, you would already be gone. If you are worried about letting it go, you have an attachment to it. But what is going to happen as you move forward with the program is that you are going to realize the relationship is hard because you are making it hard. And if I stop making it hard, then all of a sudden you are going to see that it isn’t really that hard. If I begin to let go of my demand that my partner be a certain way and do certain things and I just allow them to be themselves, then things get increasingly easier. So really, until you do that internal work and understand the obstacles, drag, and resistance you have to the energies that are in your life, you can’t really determine whether things are beneficial or not. We have these existing images and beliefs about what relationships should be and how they should look. What is good, what is bad, what is right and wrong; and in this program, we get rid of all of that. We don’t use good/bad, right/wrong; we look at things and ask “How I am resisting this and how beneficial is it?” Once we create that new foundation, things start to look differently. It might be that you are seeing your partner as an old beat up Datsun and as you do your inner work, you realize that Datsun is becoming a Lexus and you get glimpses of it as a Rolls Royce. Maybe it’s not your partner, maybe its not your career, job, or boss, or your body, neighbor, parents, family, diet, hair color. Maybe is your beliefs, images, patterns, and habits that make everything harder. Kelly: That’s good. So, then let’s go back, what is the picture of what’s possible with The Change Militia? Jeff: The challenge is that what is possible is outside of most peoples field of conceivability. When we say you can be happy all the time, they think “Oh no, to feel happiness you have to sadness or anger, there has to be contrast, an ebb and flow, yin and yang … and that’s just not true. Kelly: “RELATIONSHIPS HAVE TO BE HARD!” Someone just told me that again the other day. Jeff: Yeah, and they don’t. They don’t have to be hard. If I am being kind to myself and I am radiating kindness into my environment and I am looking for the best in everyone around me with a huge amount of tolerance and acceptance, it won’t matter what my partner does because I can have empathy for them. And if I am focusing on what I appreciate, if I am 100% focused on what I appreciate, I don’t see the stuff that, in my previous life, would have frustrated me and led to the end of a relationship. The fact that she does or doesn’t do this or that isn’t something I am going to let have more and more value. Kelly: Laughing … I was wondering if you were going to get specific there. Jeff: I’m smarter than that … and I couldn’t think of anything. And I think that’s it. I’m a guy of a thousand examples but when it comes to our relationship, I don’t think that way. Kelly: Actually, in that conversation with the person who was suggesting that relationships are always hard, like it is normal or a default, we were talking about communication. She was saying that she was trying to be transparent with her husband but in listening to what she said it was totally passive-aggressive. And when I brought it around to that, her head spun because she thought she was being so transparent. For me, communication is a big deal because we haven’t learned how to communicate. Jeff: And that’s part of that inconceivability of what we are offering because the foundation changes. We are teaching people ways to be themselves completely and eliminate the demands they have on others and in their environment, and all of a sudden what they care about changes. If you stop caring about what everyone else is doing and what everyone else thinks and whether you are having a sunny day or a cloudy day, when that just doesn’t matter, your way of being and the way you go through life changes. You look for opportunities to be nice, to brighten someone’s day and in doing that you are acknowledging how good it feels and that creates a momentum. I feel great, I want to do something nice for others, so I do something nice for someone and then I feel even better, which gives me more energy … to be kind and thoughtful.